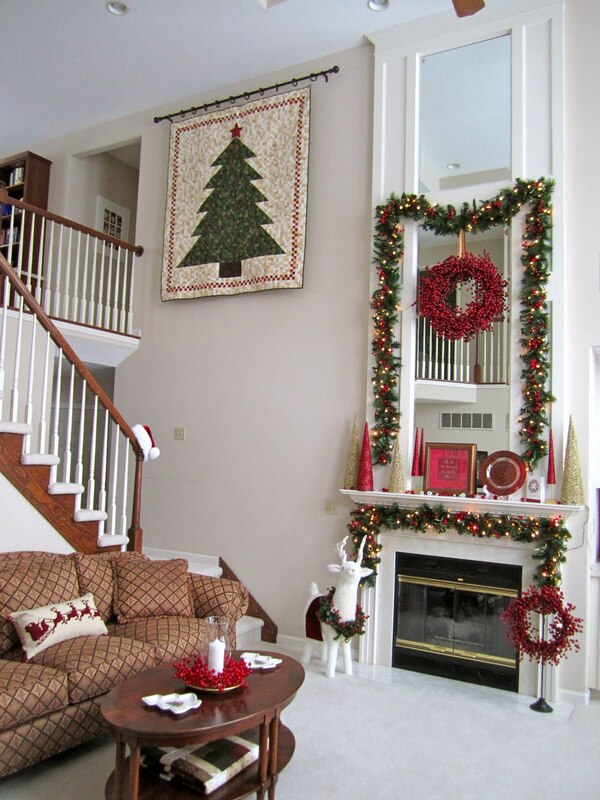 One goal that I was able to accomplish for 2010 . . . . .
my Belle Meade half square triangle units!! Here they are, not coming close to filling this basket, setting in the snow. and really loved making them! Making these units in advance, for Belle Meade, could not have worked out better. There were more than a few days, especially in the last 2 weeks, where I would maybe squeeze out enough time to make 5, but they sure added up. And sometimes, just making 5 units, was all I needed to get my sewing fix, feel like I accomplished something, and then tackle something else on my Holiday To Do list. The next time I have a project with what seems like an overwhelmingly number of small pieces and parts, I hope I'll be able to break it down over time, because that seemed to change a task that sounded tedious, monotonous, and tiresome into fun! Really, give it a try sometime! 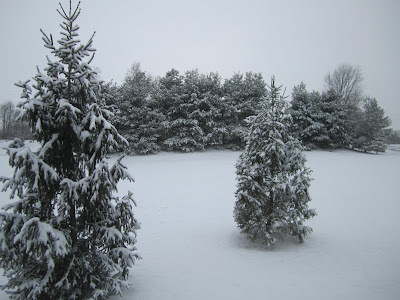 We got snow for Christmas . . . 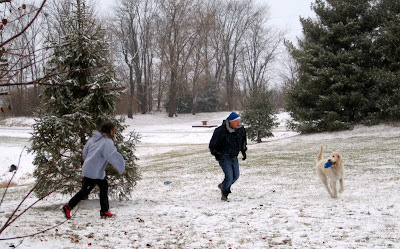 I sure hope snow didn't interfere with your holiday plans, at our house, it was just what we wanted . . .
and we made the most of it. But now that Christmas is over, I'm over getting anymore snow! Spring can come anytime now! this is the face I got . . I have no idea why! 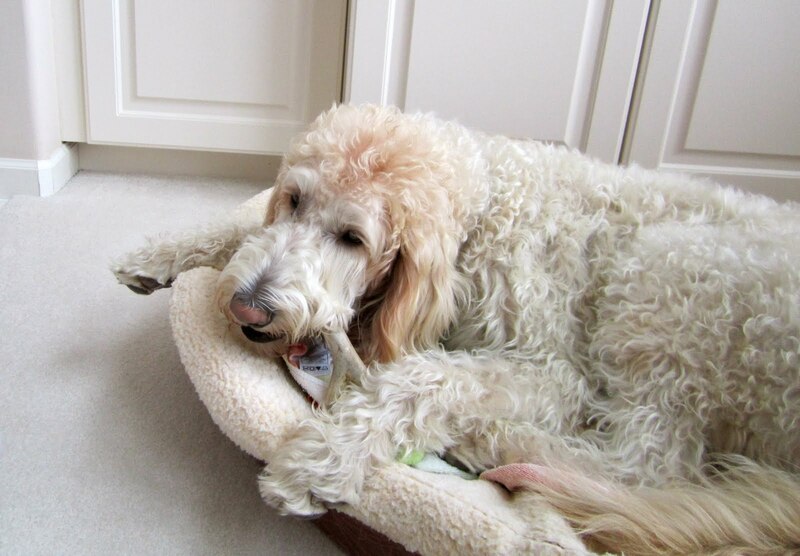 and put a nice new bone in his stocking. 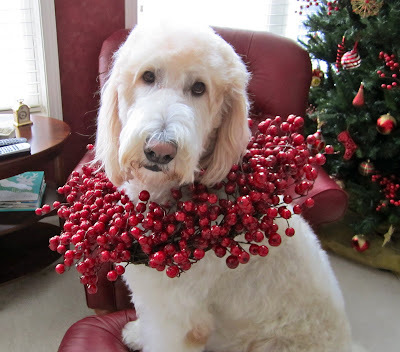 Can you believe Christmas has come and gone......I enjoyed every minute, I hope yours was wonderful too. the Christmas Tree in my sewing room. 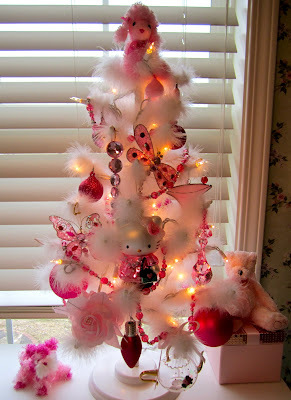 This little pink jeweled fluffy tree is the me most people don't get to see. I LOVE pink and bling, but being a conservative women in my 50's, my love for pink and bling is usually not on display. Oh, I have a few pink baseball hats and sweatshirts, but my love for pink is usually saved for my socks and under garments! But I didn't hold back when it came to my little tree in my sewing room. 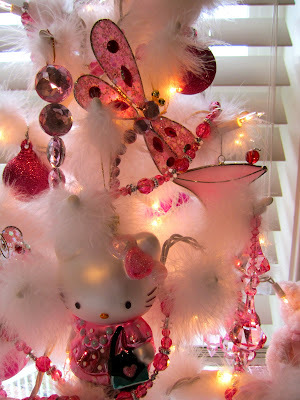 I'm not sure which ornament I like more, Hello Kitty with a purse or the pink martini glass with a cherry, or maybe the fact that both live on the same tree, and put a smile on my face, is all that matters. I hope you have a smile on your face this holiday weekend, thanks so much for being one of the gifts in my life. Merry Christmas to you and yours!!!! 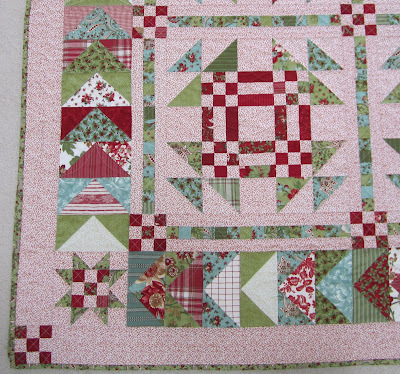 Thanks so much for all the border suggestions on my floating green and red star quilt. (Root Beer Float) Here's what I've decided, it's not going on my Lifetime Quilt List for 2010, which about makes me cry, there goes my goal of completing 12 projects for 2010. And in the end, I may decide that I am done with that quilt, but I really need to give a few of your border suggestions a try, which requires going through my stash looking for fabric, laying the quilt on the floor on a bright sunny day, and auditioning the options to find just the right combination. Cindy, the designer of the pattern Root Beer Float, reminded me that a border going all the way around the quilt looks totally different than just a strip running down the side, so I need to think about that too. So I'm giving it a rest, for now, stay tuned for an update, hopefully sooner than later! One thing I do know for sure, when I find the perfect combination, I'll know it, there's not much gray area for me, I'm either all in or all out! Walking away for a week or two is the wise thing to do. Roman Holiday by 3 Sisters for Moda. I think this fabric came out in 2007. I had only been sewing for a little over a year when it was released and I totally missed buying any fabric from that family. Every now and then when a quilt pops up on a blog that used that fabric I just swoon, wishing I had some of my own to work into something. Then, earlier this year, Lisa the Stashmaster decided to sell a few kits from her stash, kits that she really liked but didn't think she would ever make. 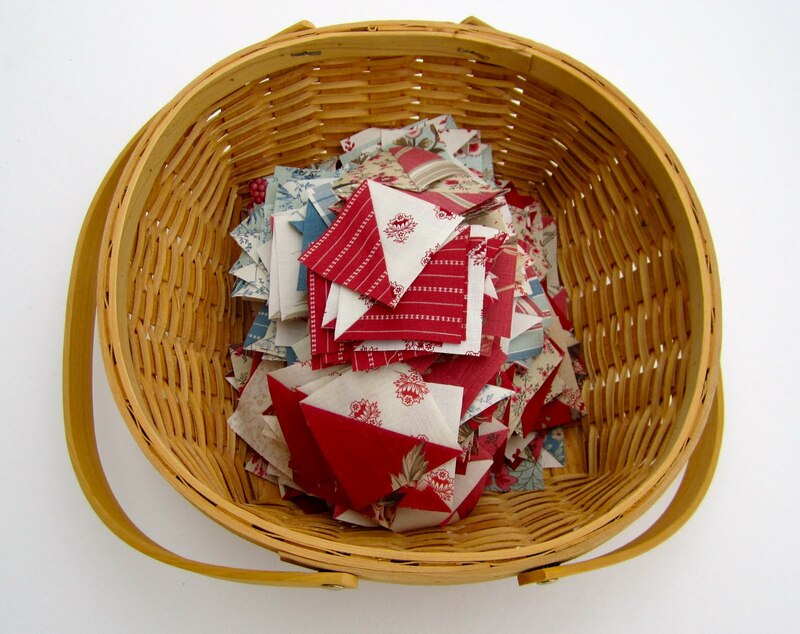 If you follow Lisa's blog, you know that picking great fabric is one of her specialities. As soon as I saw this kit I was on it, I felt like I won the lottery! The pattern was in the December 2007 issue of McCall's. 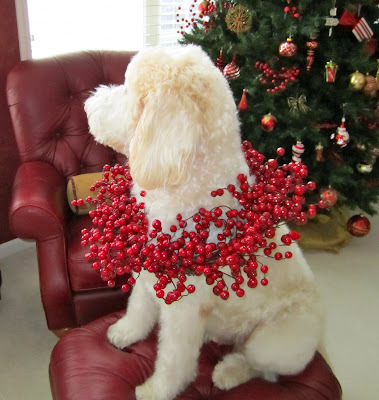 The pattern is called Red, White & Wonderful and is designed by Gerri Robinson. This quilt finishes at less than 60 inches square, I think wrapping up this year with this project will be perfect. The fabric is lovely, the piecing easy, no pattern or fabric changes on my part, really I swear, I'm sticking to this pattern, as is! Here at home, the presents are wrapped, the decorating done, the groceries bought, nothing left to do but celebrate! I picked my daughter up at the airport yesterday so the party has officially started. Plus, we're in for a white Christmas, just what my California Girl wished for, thanks Santa! They call your name, and you think, "hmmmm those cookies sure look good", I think I'll have just one"...... The next thing you know, there's nothing but crumbs on your cookie plate. I have 8 cookies left and I'm hiding those, in a container that is not clear glass, until my daughter gets home for Christmas. She can have two, I'll have two, my husband can have two, and that leaves 2 for Santa. I'm hoping that if those cookies start calling my name before Christmas Eve, I won't hear them!! Looking for a last minute gift idea? How about fresh flowers? We received this beautiful holiday flower arrangement a few days ago. Fresh flowers don't immediately come to my mind when decorating for Christmas, but I just love having something beautiful and blooming, it adds such a nice touch to my regular decorations. Where we live, there's nothing blooming outside, and the only green, the evergreens, covered with snow, so having something blooming inside is wonderful change of pace. Well, I liked the the star blocks so much I decided to go with 4 rows of 4 blocks instead of the 3 by 3 that was my original plan. And said, "Hallelujah" (maybe I need to scale back on the Christmas music). So I sewed those blocks together before I could change my mind. There was nothing but smiles all around my house, I was loving that center, all I needed to do was add my containment border and outer border, and I would have one more quilt on my Lifetime Quilt List and one less on my To Do List. What a way to wrap up the year. This was the fabric I bought for the border, it's beautiful fabric, and when I cut it just right, it forms it's own containment border. but not a good fit with what I've already done. 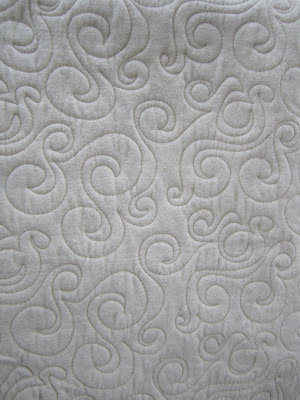 What do you think, does this quilt look done to you? but I'm glad I gave him one that really suits him. I particularly liked Dianne's comment about me feeling sad to see this quilt go to a new home, "it will hug him when you can't, and you can't get any better than that". I could not agree more! While I was home, I baked cookies with my Mom and niece and we made a great team. My Mom made the dough, I was the official roller, my niece the cutter/decorator, and then my Mom watched the oven, so technically I guess she was the baker. This was the first time I'd made sugar cookies from scratch! I know, over 50 and just now making cookies, but it's never too late to learn! When my daughter was smaller, we would make sugar cookies from the refrigerated prepared dough in your grocer's case. It was easy, they tasted OK, and the decorating was fun. As a matter of fact, they turned out so well, I'm thinking of buying cookie cutters for every holiday. I bought this Little Petite Candy Dish at Williams-Sonoma around Thanksgiving. They had it displayed in the store with candy and it looked so cute I couldn't pass it up. But once I got it home, it looked pretty sad, sitting empty on the counter. Well it's empty no more! The funniest thing of all, I collect Christmas Cookie Jars, and my folks gave me #20 over the weekend... and I just love it and think it will look nice sitting out the rest of the winter. But with all those cookie jars I collected over the years, they always sat empty! I NEVER made cookies. they aren't going in a jar, I want to see them, so the cookie jars are STILL EMPTY!! 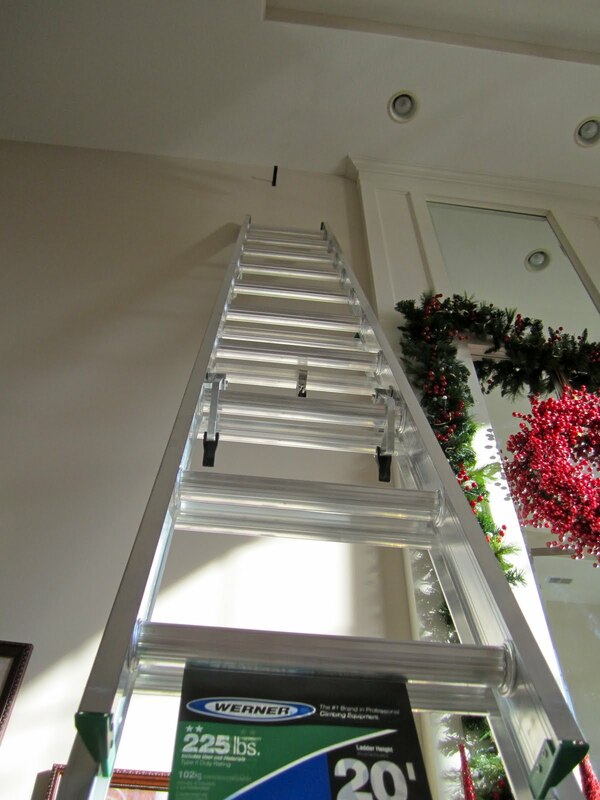 I hope you're enjoying the holidays at your house, from the decorating and baking to the time spent with family, it really is "the most wonderful time of the year". Towards the end of last year, Nicole of Sister's Choice Quilts and Allyson of Fat Cat Quilts hosted a sew along, The Red and Cream Snowball Sew Along. The pattern is Leftovers Again? 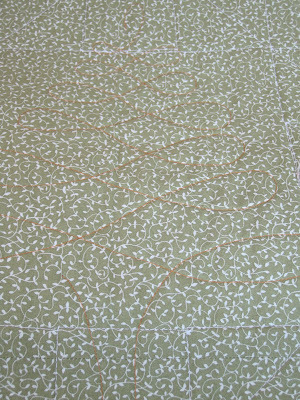 by Evelyn Sloppy from her 40 Fabulous Quick-Cut Quilts book. The sew along was fun and some of us even swapped creams. The piecing was a breeze and my quilt went together easily. 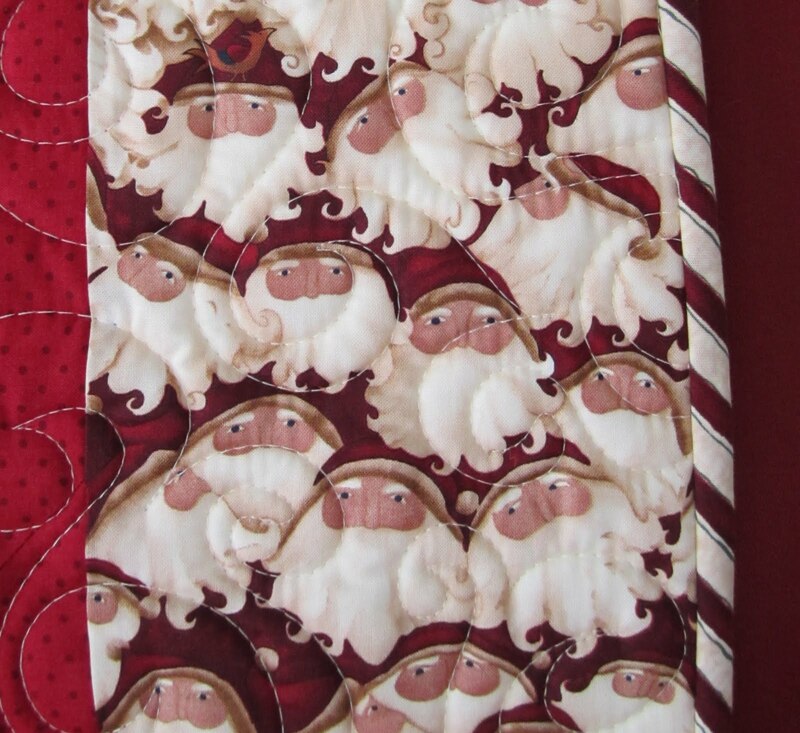 I re-named my quilt "He Knows When You Are Sleeping" because I added a few Santas in the mix. I took the flimsy to the quilter and pretty much put the whole thing out of mind, since I didn't need the quilt anytime soon. Well I just picked the quilt up from Dawn at The Sewing Basket and am so happy to have it home on my red couch. The back is cream Moda flannel, very warm and cozy feeling. Dawn used a pattern that had the same look and feel as the Santas beards in the border fabric. I loved making this quilt, am pleased with how it all came together, and am giving it away. I'm wanting to make a quilt for every member of my family, my Dad loves Santas and all Christmas decorations in general, so once I got this quilt home, I realized it should really belong to my Dad. 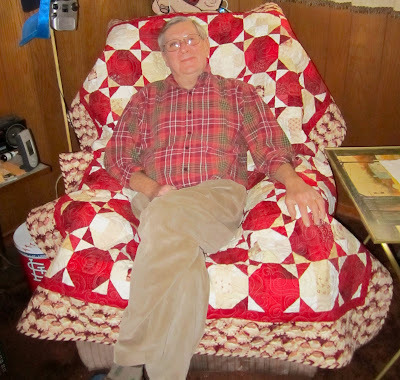 I'm a little sad to see it go, which is a first for me, I've never had any trouble giving my quilts away, but I'm sure once I see him sound asleep in his recliner, under this quilt, I'll feel pretty good about the whole thing. I seem to be doing a little bit of everything right now, a little bit of wrapping, a little bit of addressing, we even got a little bit of snow. Just a couple of inches that when added to 40 mile an hour winds caused a little bit of a mess. Luckily for me, I just stayed in and watched it from my window. I've also been able to squeeze in a little sewing! 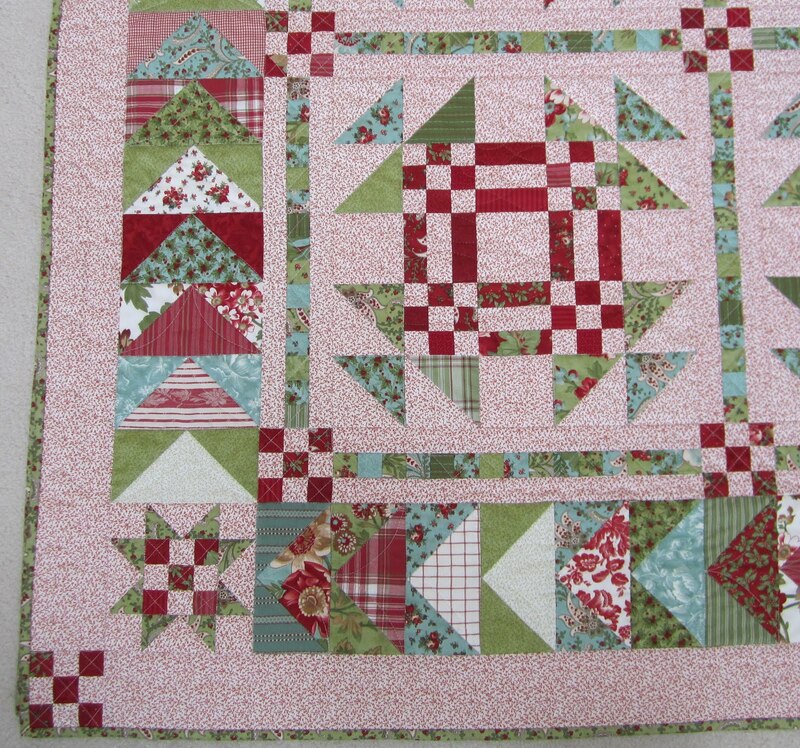 I'm still undecided on what to do about the red stars in this quilt, but I have decided on something else. I'm going with this fabric for the sashing and cornerstones for my floating star blocks! My original plan was to use a tone on tone cream, but that was too plain. This fabric was made to surround those stars, don't you think? Just in case you've forgotten, the fabric is Olde World Style by Monique Dillard for Maywood Studio. 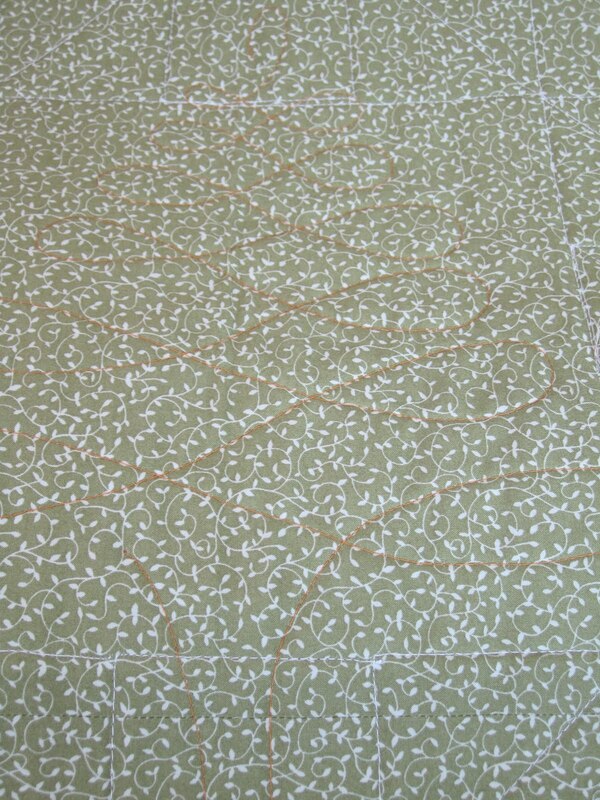 Thanks Monique, that fabric is just the perfect style and width for this project! So, like I said, I'm having no trouble with the green star blocks, but I'm still trying to decide what to do about the red stars, but I have made progress! If you consider narrowing my choices down to 3 progress! Thelma, give it up, not every quilt needs red! Anytime I'm in the general neighborhood of my sewing room, I take a peek at my design wall, sooner or later it will come to me, I just know it, in the meantime I'm making more green blocks! this very tall ladder, a little bit of nerve on my part, and a husband who doesn't complain about holes in the wall!! 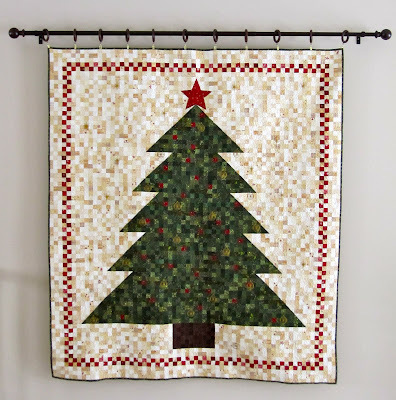 This time last year I was working on "Oh Christmas Tree" by Farmhouse Threads. It was a great December project and this weekend I enjoyed going back and reading my December 2009 posts. 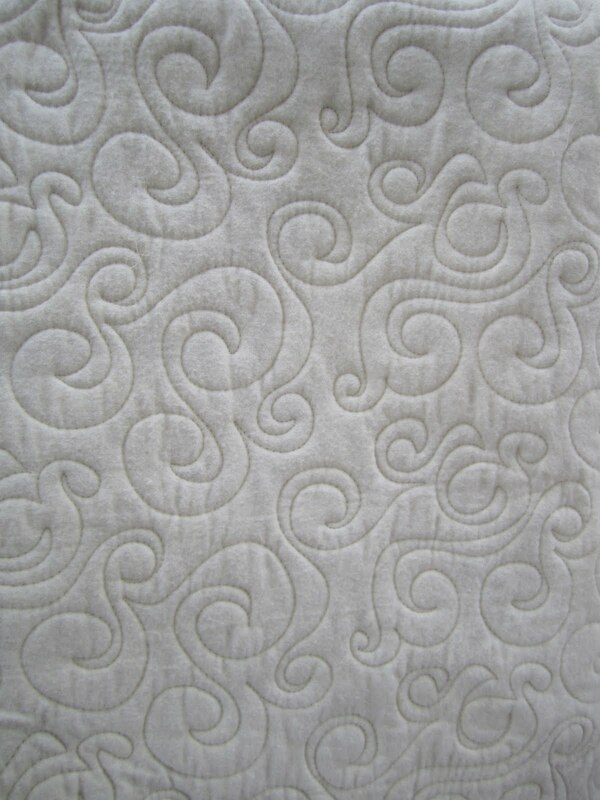 That's one of the many things I enjoy about having a blog, it's such a great reminder of the highs and lows of my quilting projects, this project was nothing but highs. Oh Christmas Tree is home from the quilter. Dawn, at The Sewing Basket, did a wonderful job of bringing this tree to life. 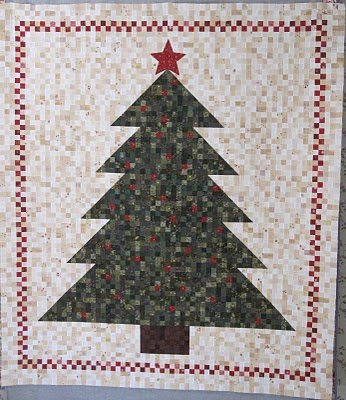 The back shows the amount of detail and thread that went into quilting the tree. and the trunk looks like it was just cut. Whoops, one ornament fell off somewhere between Dawn's shop and my house! right where I wanted it . . . This is lifetime quilt number 53, it finished at 66" X 75 ", and has approximately 4,950 pieces. To read more about Oh Christmas Tree, select "Oh Christmas Tree" from the "Categories" list on the lower right of my blog.